Contraction surgery is a fun way to practice forming contractions! 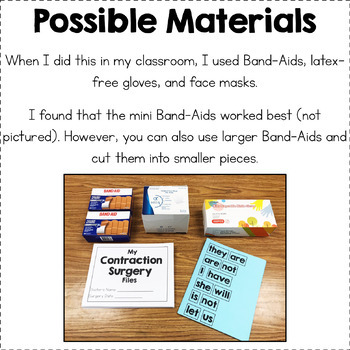 Students will cut apart the word cards and then glue them together to form different contractions. They can then stick a Band-Aid where the “scar” was left and write an apostrophe on the Band-Aid. There are two different versions of the student “surgery book”. One version entails students simply making the contraction and writing the two words that form the contraction. The other version includes making the contraction, writing the two words that form the contraction, and writing a sentence with the contraction. Use the version that best meets your students’ needs! 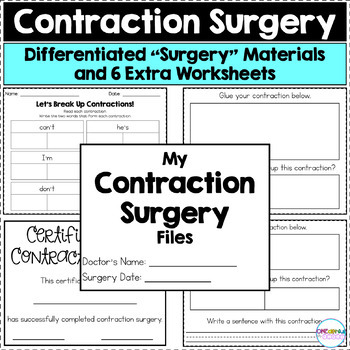 There is also a certificate of "contraction-ology" to give your students after they finish the contraction surgery. 6 additional worksheets for extra practice are included as well. If you purchase this product, please leave a rating and review. I hope you and your students enjoy this product! ⭐ Digraphs - Real Word or Nonsense Word?